Morecambe wide man Lewis Alessandra has quit the Shrimps to join League 2 rivals Plymouth. The out of contract 24-year-old had originally agreed to sign a new deal at the Globe Arena but had a change of heart after the Pilgrims made a move for him. The forward has signed a two-year deal at Home Park in a move which reunites him with manager John Sheridan who handed an 18-year-old Alessandra his Football League debut with Oldham. He becomes the fifth Shrimps first-team player to leave the club with boss Jim Bentley having to cut his wage budget. Bentley said: “Lewis has done really well for us over the past two years and I am obviously hugely disappointed to lose him. “We had a chat a few weeks ago and he said he intended to sign on again but has since had a change of heart with another club coming in for him. “Although I am disappointed it means we will have to look at other avenues and stay positive. Sheridan told Plymouth’s official website: “I’m very pleased to have signed him; I think he’s at a good age and he can be a really good player for us. “When he first came on the scene I thought that potentially he could play at a really high level but he took a bit of a backward step when he was at Oldham. 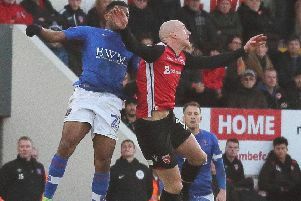 “Fair play to him, though, he went to Morecambe and sorted himself out and for the last two seasons, he’s probably been Morecambe’s most consistent player. “He’s got a lot of things to his game - he can play on the wing and anywhere across the so-called front four - but I like to see him up front. He will officially become an Argyle player on July 1.